Last Illustration Friday's theme was "Stitch". Even though this theme is right up my alley, it took a while for me to come up with an illustration. I decided since I sew and quilt and alter and mend, that I would be a good illustration for the word. Here is an print of me and my big bird done with a Gocco screen onto fabric printed with acrylic paint. I hand stitched the words. It seems (seams?) 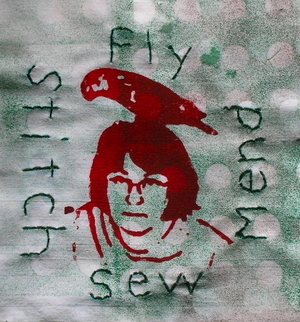 unlikely a parrot would be thinking about stitching, so she gets the word "Fly". Lovely, it brings back fond memories.